Mark Your Calendars!! It's time to (re)Organize a Party! The Party is yours, so you can always work to change it, reshape it, reorganize it and take it over. One of the simplest and most direct ways to do this is not by giving money to the Party but rather giving time… and not even that much. 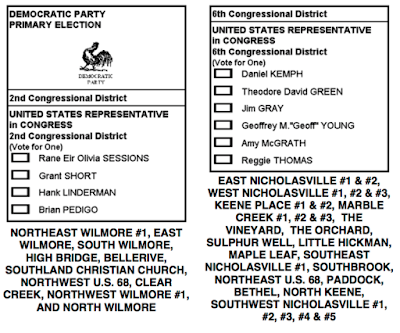 On March 31st, 2012, the Democratic Party will gather at in its most local form… at voting precincts around the State. If you are a registered Dem, then at 10AM on March 31st, you just go to your local polling place. In other words, you are not only on the front lines of the Party, you are shaping the Party. You are taking control of it. It also means you have the chance to move up the ladder. If you are elected to your Precinct Committee, you not only then vote at the County Convention (April 14th), you could become a delegate to the State Convention (June 2nd) and you could, further, become a delegate to the National Convention… one of those very excited political nerds and other assorted weirdos who wear funny hats, hold vertical state signs, and clap on queue when they are told to in the midst of a massive political carnival. I’m oversimplifying all of this, of course, but… if you want to be a delegate, if you want more control over the Party, or if you just want to be more involved, March 31st @ 10AM is the time to start. The Kentucky Democratic Party has created a handy reorganization manual (PDF) with a lot of information! GET INVOLVED! IT IS YOUR PARTY!